A practical guide for licences ministers prepared by the SQC Ministerial Department. This should be arranged at 6-12 months prior (some ministers ask for longer) to the wedding to give the chance to meet at least 6 times without time pressure before the wedding day. It can be a good idea at the first meeting to use this as an opportunity meet the couple, and to outline the requirements and expectations of the preparation for marriage, in case the couple decide that this is not for them. (eg. that we will do some Bible study, sharing together about marriage, open and honest discussion about their relationship, and in the case of believers, that abstinence is part of God’s plan for their marriage preparation). 1. Have either of the parties been married before? If yes, what is the status of that previous marriage? (Dissolution/ Divorce must be finalised PRIOR to commencing arrangements for a new marriage. 2. Other keys e.g. Marriageable age/ are the parties related etc are covered in the Notice of Intention to Marry Form – see item 2 below. 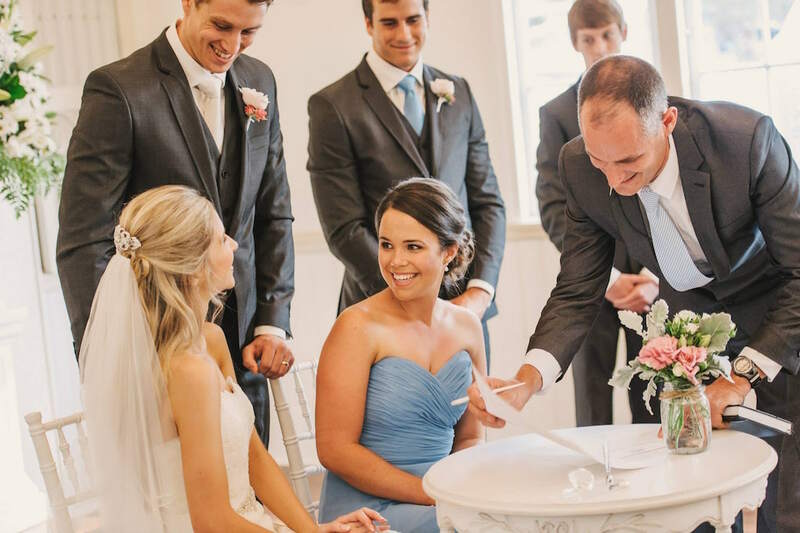 At this stage it can be helpful to share with the couple an outline of proposed meetings together to help them successfully plan the lead up to their wedding day. Make arrangements to continue with Pre-marriage mentoring. Excellent Guidelines are found at https://family.adventist.org/preparing-couples-for-marriage/. This should be a time of discovery and a great opportunity for the couple to form a good strong relationship with the minister. Prepare Enrich (PE) is a useful tool that may form part of preparing a couple for marriage (as well as being an excellent tool for marriage enrichment). PE Facilitator Training is arranged for the SQC Ministerial from time to time at a reduced rate. The NOIM (Form 13) must be received at least one month before the wedding day. Note: Recent changes effective 01/01/15 allow for Australian passports to be used as evidence of identity and place of birth. Be aware that Australian Passports do not show parentage, so the QLD BDM recommend that you still request to sight a full birth certificate which shows parentage. If either the groom or bride are not able to produce a birth certificate, then you can then accept an Australian Passport if they are born in Australia. For parties/ couples who cannot produce an Australian passport, a birth certificate must be sighted. if people do not have birth certificates (e.g. some from overseas do not) you can sight other identification documents such as visa’s etc but these must have a statutory declaration supplied by the couple from a JP who has sighted the originals. Also if you are marrying someone you know who lives interstate and there is no way for you to sight the documents in person before the marriage, they can supply a statutory declaration from a JP who has sighted the originals and these can be posted to the celebrant. On receipt of the NOIM (Form 13) it is a legal requirement that you present the couple with a copy of the Document outlining the obligations and consequences of marriage and stating the availability of marriage education and counselling (Form 14A – Also known as the Happily Ever After Brochure). Considerations in Planning for the Wedding Day can be downloaded here. It is often helpful to give the couple a copy of a sample program, and to work through the details with them. A sample program can be found here. It is also usually helpful to share examples of Traditional, Religious and Personalised Wedding Vows for them to make decisions about their vows. Have the couple sign the FORM 14 Statutory Declarations. b. As the Registered Minister/ Celebrant, complete and sign these. In this case, the celebrant registering the marriage has sighted the original identity documents according to the Marriage Act 1961. 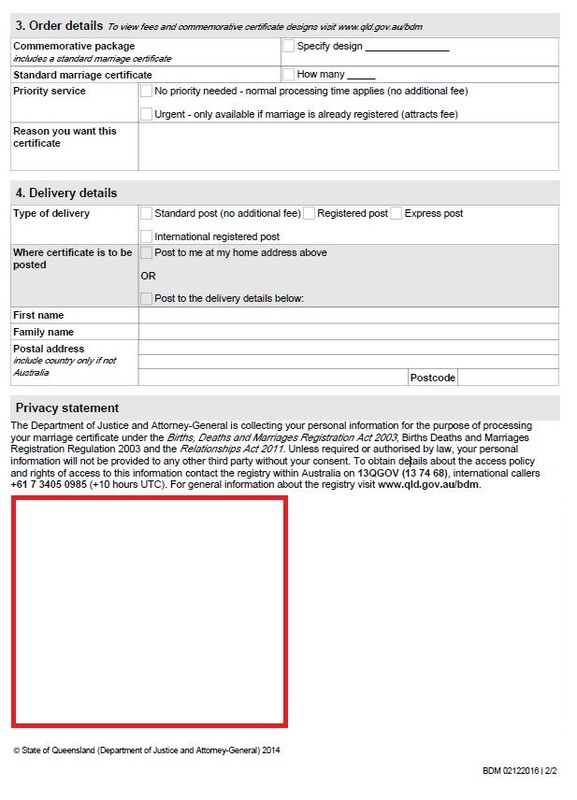 As an authorised witness the celebrant must record the following information at the bottom left hand side of the last page of the marriage certificate application (underneath the Privacy Statement). • Applications must be completed and signed by one of the parties of the marriage. • Celebrants must not complete the form on the couple’s behalf. • The certificate will be mailed directly to the applicant or if requested, the applicant can choose the certificate to be sent to the celebrant. ‘No additional charge is to be made by the celebrant for sending the application on behalf of the couple’. • Marriage certificate applications must be accompanied with paperwork for the marriage registration i.e. Notice of Intended Marriage and Official Certificate of Marriage, along with Stat Dec of ‘No Legal impediment to Marriage’. • Please be advised the registry will not accept cheques. • Any refunds associated with the application will be reversed back only to the original card holder. A. FORM 15 The decorative “Certificate of Marriage” which is useful for display and some proofs of marriage (some banks and other organisations do not recognise Form 15 and require an Official Certificate from the government – see further down. The completed Form 15 is to be given to the couple following the Solemnisation of the marriage. B. FORM 16, also known as the official “Certificate of Marriage”. A new Form 16 has been issued effective 1 July 2014 and must be used from 1 Jan 2015. Hard copies are supplied by the Ministerial Department at the Conference Office or can be ordered from the relevant Department of BDM in your State. The new form can be downloaded below. The BDM is able to ask for this copy at any time. Failure to produce it is an offence and fines apply. The Australian government requires that the 2nd copy of the marriage register be stored in a retrievable system stored in perpetuity – ie. that it can be retrieved upon request at any time. In order to adequately satisfy this requirement, AUC wide, the Ministerial Associations in each Conference encourage each certified minister to keep their own copy (Red Book), and that upon retirement a minister is to return the Red Book to their Ministerial Association Secretary. For marriages where another Red Book has been used, it is highly recommended that the minister Record which Marriage Register he has used for each wedding so that it can be produced upon request. The marriage register, being a hard-cover book, is also useful for keeping the other documents (Forms 15 & 16) in during the ceremony to avoid them being blown away in the wind. 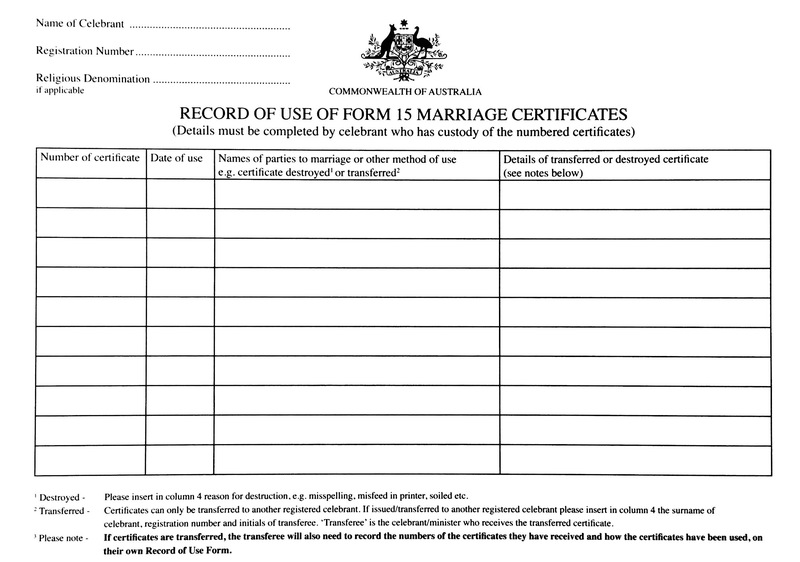 Marriage Registers can be ordered from the Ministerial Department at the Conference Office or from CanPrint at canprint.org.au or phone 02 6295 4422. It is also wise to make it a habit of bringing an attractive pen for use during the photos in case the couple have failed to provide their own. This is a common oversight by couples which is easily saved by the Minister being prepared! A. Ensure that you have given the couple their FORM 15 – Decorative Certificate of Marriage. D. If the couple have requested an announcement in the RECORD (SDA Church magazine in Australia), ensure you send this notification as soon as you can as it can take a couple of months for the announcement to appear in print. It is advisable to send the announcement or register it online in at or before the time of the wedding to speed things up (you may need to ask the couple for a photo to send with the RECORD announcement). Check in with the couple to say hi after the honeymoon is over! Maintain contact with them as appropriate.